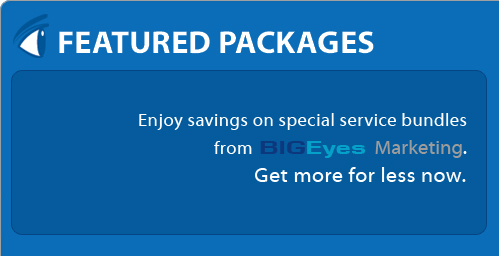 BIGEyes Marketing has just released a special DESIGN, MARKETING, and ADVERTISING package for smartphone apps (iPhone, Blackberry, DROID, Palm, and Windows). Click here to learn more about the App Starter Package. During the development of your site, we ensure your site is optimized for search engines. Click here to learn more about our Search Engine Optimization (SEO) services. Customers who want to save BIG can simply purchase a special service bundle where we include different package into one cost effective special, offering over 20% savings if you were to buy the packages separately. 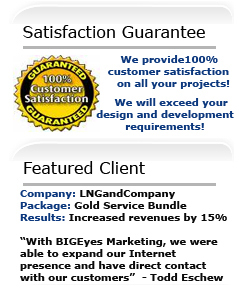 With a special service bundle, customers will receive the same outstanding consulting and designe services from BIGEyes Marketing. More imporatntly, we wil ensure that all the different packages communicate the same clear and consistent message.